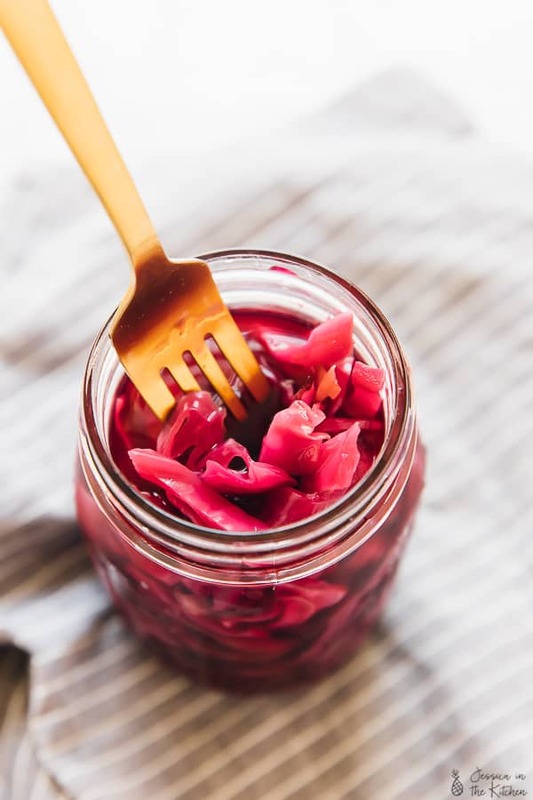 This Quick Pickled Cabbage recipe takes only 10 minutes! It completely transforms the pickles, and adds a divine pop of flavour to any recipe. Use them in sandwiches, tacos, burgers and any recipe you like! 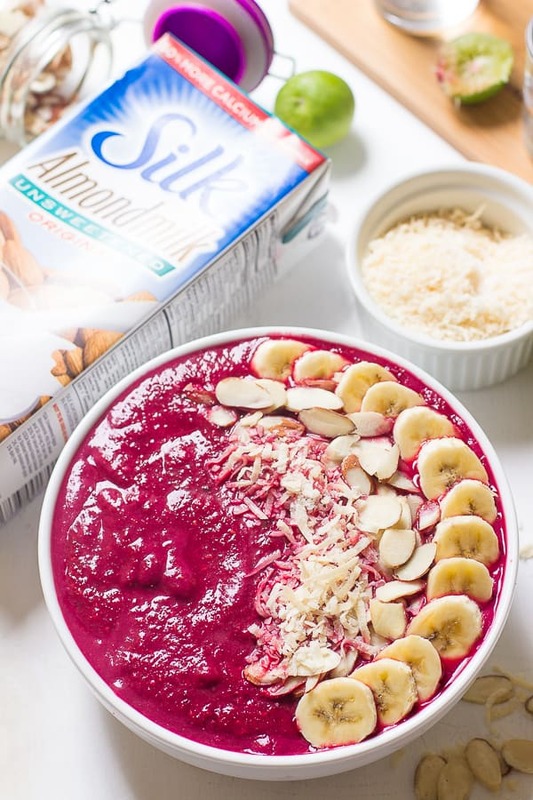 There’s something completely satisfying about a simple recipe that’s done so beautifully well. A recipe that doesn’t need much effort or work, yet comes out so divine that you wonder, what was that flavour that made it so unique? Often times this has happened to me in restaurants and I realised that the chef did something to a particular ingredient that I’ve never done, so of course I wouldn’t be able to figure it out. 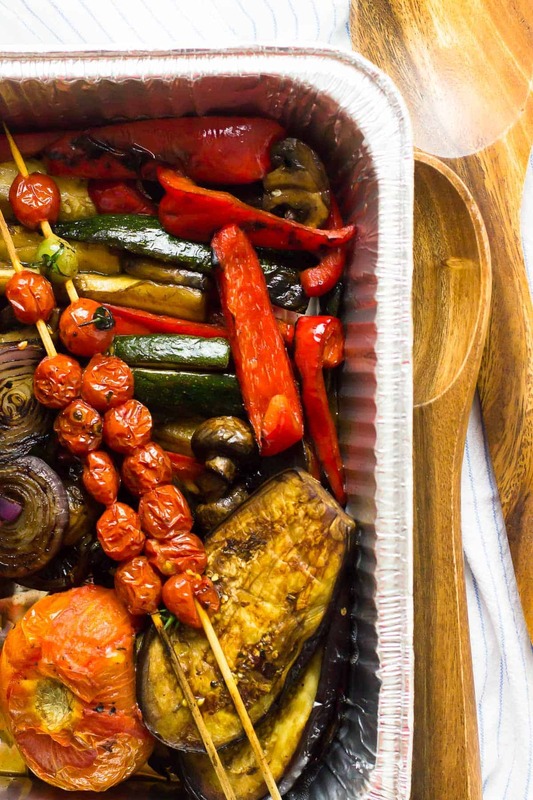 Case in point – using pickled vegetables. On their own it’s obvious, but when in combination with other ingredients, what a beautiful medley of flavours it can create! This Quick Pickled Cabbage certainly does that. Add this to an already delicious vegan burger with a creamy sauce. To a taco. To a slaw. It creates something close to perfection. A sweet, brine-y flavour that you almost NEED each time now! Use this simple recipe for any of the above and see the magic to come alive. Boil the vinegar, then add the veggies, then soak. It’s really that easy. Then of course, let the fridge do the rest of the work for you. The real work happens when the vegetables are cooling, and by the next day, it’s like a true masterpiece. Apart from the divine flavour, one of my favourite things about this quick pickled cabbage is that beautiful pink hue! It makes any meal automatically prettier, which already makes you feel like it’s going to taste better, so win, win, right? Add in the red cabbage, and allow to boil for 2 minutes with the red cabbage. 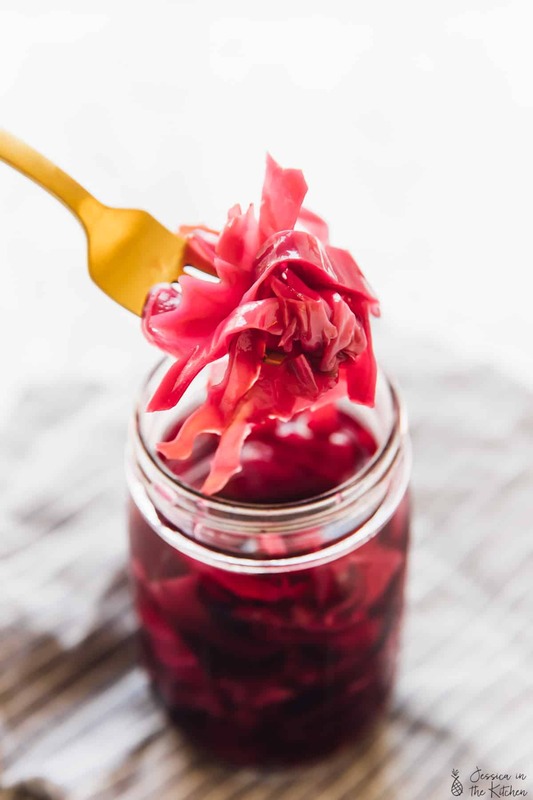 Remove from heat, let cool for 1 minute, then pour into a mason jar large enough to hold everything and that also allows the red cabbage to be completely covered in the vinegar mixture. 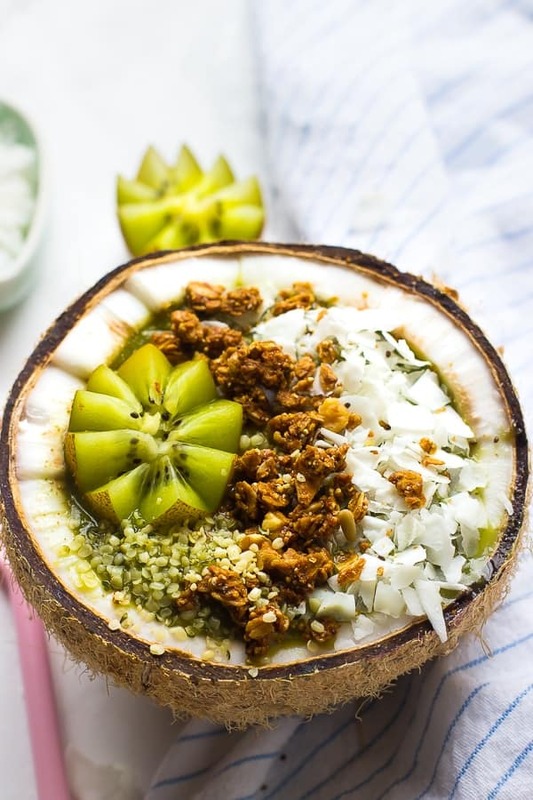 Add in the lime slices (optional) and swirl together to mix everything together. I am bookmarking this to try! Funny, a couple of days ago my brother and I swapped pickle recipes. He gave me a pickled onion recipe and I gave him our mom’s refrigerator pickle recipe. Maybe pickling fresh veggies is a sign of spring? Or maybe great minds think alike! Thanks for the recipe. I had a pickled onion on a veggie burger in a restaurant that made the burger outstanding. I didn’t know it was so easy to do. Can’t wait to try pickling my veggies. I really enjoy your post!!! Thanks so much Patty! I hope you enjoy!! I’m assuming that the sugar is optional for taste, but is the salt essential for the pickling process? I am attempting to eat zero added sugar and zero salt WFPB. Would this work at all or would I be wasting good cabbage and vinegar? These pictures are breathtaking. Thank you so much for sharing! 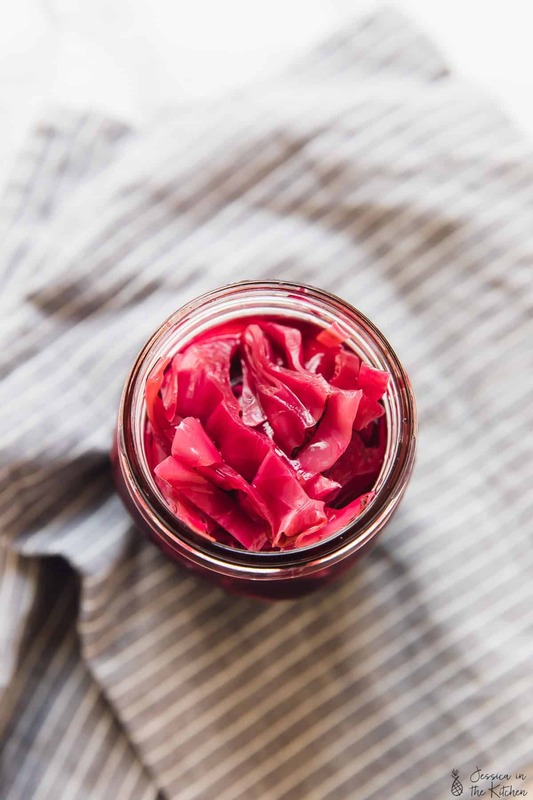 Can’t wait to make my own pickled cabbage at home – I haven’t made sauerkraut in ages, but my family needs to get some more in their diets! It’s getting hot and a jar of pickles will be a perfect addition. Thank you for the recipe! Greetings from Pakistan. Thank you for a delicious and quick recipe. My pickle is about to go in the fridge. Can’t wait using it everyday. You’re so welcome! Thanks for leaving such a kind message. We hope you enjoy! Youuuuu Rock, Jessica! Have made this repeatedly…sooooo delicious!!!!! I also wanted to try eating seaweed but the “sea” taste I couldn’t get past until I pickled it using your recipe. Now i eat it all the time on top of my salads with a little olive oil….no need to makes a dressing!!! Thanks again! !